Michael McFadyen's Scuba Diving - 6MP, Queensland Great Detached Reef is located at the northern end of the Great Barrier Reef off Queensland, Australia. It is about 125 nautical miles (230 kilometres) from Thursday Island in the Cape York area (the pointy tip of Australia) and 75 nm (140 kilometres) from Lockhart River. The is 45 nm (85 kilometres) east-north-east from closest point of the Australian mainland, Cape Grenville. It is just over 4 nm south of Raine Island, the largest green turtle nursery in the world. 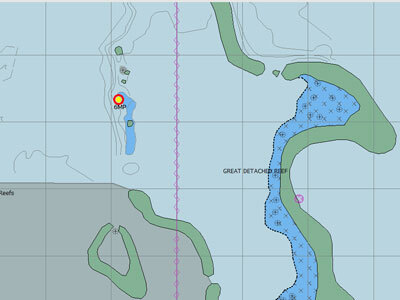 6MP (for Six Metre Reef) is located on the western side of the Great Detached Reef lagoon. This side is mostly open but along this side there are a series of small reefs and bommies that runs from almost north to south. Its location is GPS S11º 43' 19.3" E143º 58' 13.4". The depth on the top of the reef is about five metres and from here it drops vertically to 40 metres before dropping off to over 60 metres. Boats can only anchor on the eastern or north-eastern side of the bommie, as this is the shallowest. Normally the boat would then hang back to be very close to the bommie. This site normally has a current, but even if it is fairly strong, you only encounter it on about 20% or so of the site. As mentioned, 6MP is a bommie that comes up from about 40 metres to almost the surface. It is almost perfectly circular in shape. Once you enter the water, the best dive is to drop to the depth you want to visit (we went to 37 metres on our first dive here - we did three) and then gradually circling the bommie and ascending as you go. We did this by going anti-clockwise. Down at depth there are some huge gorgonias, these are on a bit of a slope on the north-western side. There are lots more gorgonias on the vertical walls, but these are generally smaller. 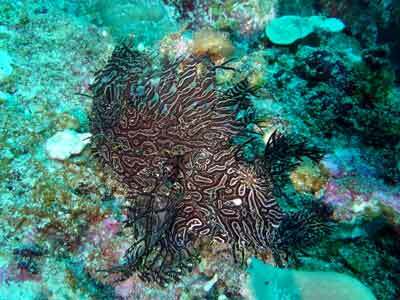 As you ascend, you will see amazing colours of the reef, soft and hard corals, all sorts of tropical fish. As the current hits this reef, the fishlife is simply amazing. 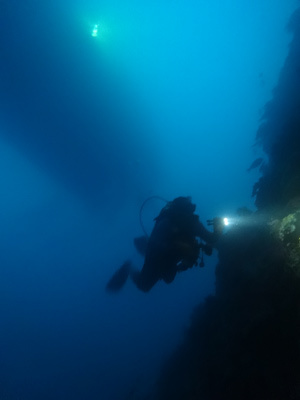 This is one of the best dives I have ever done, as good as Steves Bommie on the Ribbon Reefs north east of Port Douglas. 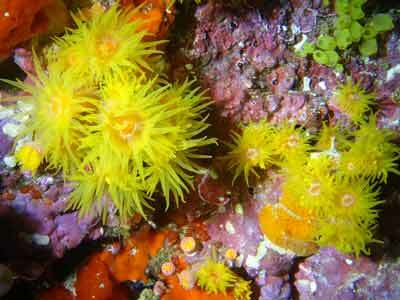 There are lots of small overhangs in the reef which are home to many things. 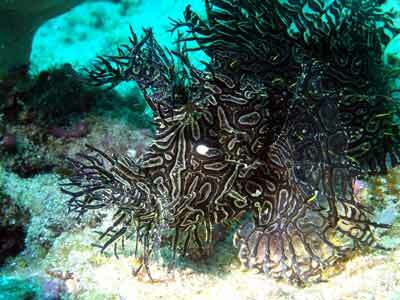 We found a lacy scorpionfish in one, brilliant, only the second one I have ever seen in almost 4,000 dives. On the up current side the fish are in enormous numbers. There are quite a few sharks, plenty of kingfish, barracuda, parrotfish, unicornfish, surgeonfish and more. They swim in and out of view, there is plenty of movement all the time. As mentioned, as you circle the bommie you go up by two or three metres each loop. You tend to encounter the same big fish time and time again. On the reef there is also plenty to see. 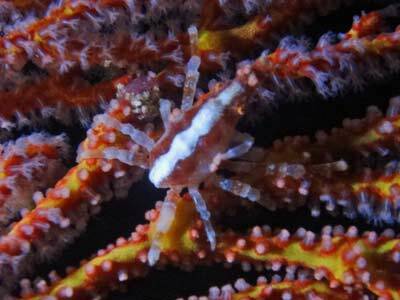 On the gorgonias there are glass shrimp, there are plenty of anemones and clownfish (and some glass shrimp), soft corals with cowries, jewel anemones and dancing shrimp. The closer you get to the top of the reef the fishlife gets better. There are bannerfish, Moorish idols, many different species of tropical fish, so many it is hard to remember them all. On the southern side at about 14 metres there is a largish cave. This has a couple of levels. You cannot really enter it, I suppose it is more of an overhang, but a big one. This is a great place to see very special things. 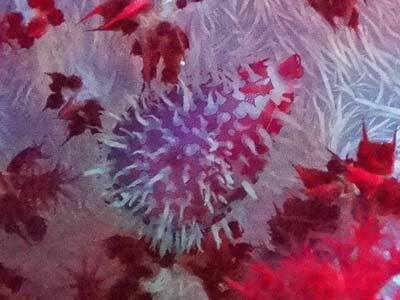 In here we saw a lacy scorpionfish (Rhinopiaus aphanes). They are very hard to find as not only are they relatvely rare, they are masters of camoflauge. The crew advised that they have seen them here before. The gorgonias are also worth close examination. We found spindle cowries, glass shrimp and a type of shrimp on them. You will need to look closely. The anemones also are worth examining. They, of course, have clownfish (mostly Clarks and orangefin anemonefish, but also some pink anemonefish). 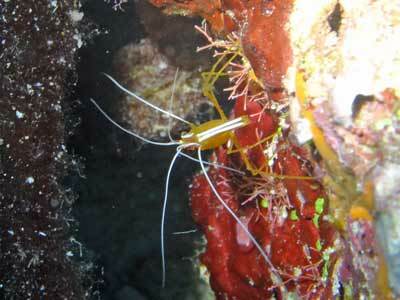 They also have glass shrimp and some had the very strange dancing shrimp. 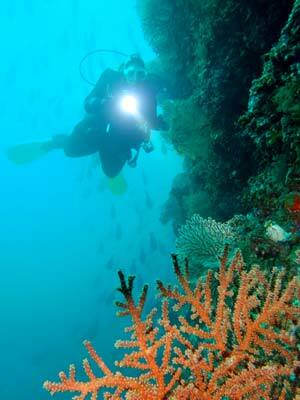 As the top of this reef is about six metres, it is a perfect spot to end your diving doing a long safety stop here. 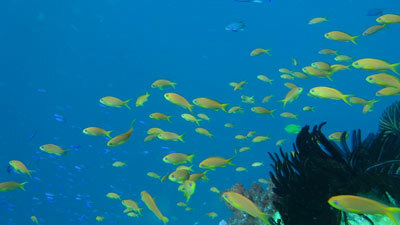 There is plenty to see on the reef, and you can also look out into the current at the sharks and large fish swimming by. We dived here in November, the water temperature was about 28ºC, visibility about 30 metres. 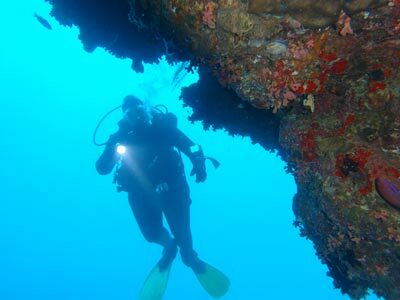 A brilliant dive site, the best we did on our trip.